JEFFERSON CITY, Missouri, May 3, 2011 (ENS) – A levee along the Mississippi River was blown up by the U.S. Army Corps of Engineers late Monday night to save a small Illinois town from floodwaters at the intersection of the Mississippi and Ohio Rivers. The blast tore a hole in the Birds Point levee and allowed the swollen Mississippi River to flood 200 square miles of southeast Missouri farmland in Mississippi County called the Birds Point-New Madrid floodway. Authorities had ordered area residents to evacuate late last week. The U.S. Coast Guard, Army Corps and state and local agencies moved quickly to remove residents from imminent danger. Last week, the state of Missouri filed an injunction to prevent the Corps from blowing the levee. On Saturday, the Eighth Circuit Court of Appeals denied the efforts of Missouri Attorney General Chris Koster to stop the Army Corps of Engineers from destroying the levee. Koster appealed to the U.S. Supreme Court. “In light of the devastation faced by the citizens of Mississippi County, devastation that will persist in the area for years to come, it is the responsibility of this office to pursue every possible avenue of legal review,” said Koster. On Sunday, the U.S. Supreme Court refused the request to halt the explosion. On Monday night, Major General Michael Walsh, president of the Mississippi River Commission, gave the order to operate the Birds Point-New Madrid floodway in Missouri for the first time since 1937. “Everyone I have talked with – from boat operators, to labors, scientist and engineers, and truck drivers – have all said the same thing, ‘I never thought I would see the day that the river would reach these levels’,” said Walsh in a statement. Just before the blast, the river level at Cairo was at a record high, creating pressure on the floodwall protecting the town. Walsh made the decision to open nearly 11,000 feet of levees along the river to provide relief to the floodwall. The National Weather Service said before the levee was blasted, the level of the river at Cairo was 61.72 feet and rising. By Tuesday morning, the river was at 60.62 feet and was expected to keep falling to 59.4 feet by Saturday. But the flooding crisis is far from over. 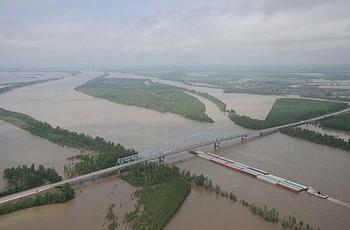 Flood levels are likely to be exceeded this week at many points along a 400-mile stretch of the Mississippi below its confluence with the Ohio River, said Weather Underground meteorologist Jeff Masters. AccuWeather meteorologist Alex Sosnowski predicted that water levels from southern Illinois to western Tennessee and northeastern Arkansas would rise higher than the record levels set during the late-winter flood of 1937. “With more rain expected, Coast Guard teams are ready to help residents in the impacted communities of Missouri, Kentucky, Illinois and Tennessee,” said Cmdr. Claudia Gelzer, commanding officer of Coast Guard Marine Safety Unit Paducah. Several Coast Guard disaster area response teams, or DARTS, have been operating in the area with six-member crews assigned to each of three 16-foot boats. Outfitted with rescue and communications equipment and supplies, the DARTs compliment reconnaissance patrols by truck in flood-prone neighborhoods to ensure the safety of local residents. To date, Coast Guard and local agencies have rescued nine people from their homes. DARTs and local fire rescue team rescued six in Morehouse, Missouri, and a DART rescued three elderly women from their flooded house in Smithland, Kentucky, following the voluntary evacuation of the town’s 352 residents. Tuesday afternoon, the Army Corps detonated another blast, blowing out part of a levee near New Madrid, Missouri, to allow water flowing in at Birds Point to make its way back to the Mississippi River. 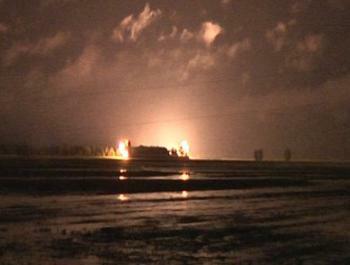 The detonation could be heard and felt about 20 miles away in Sikeston, Missouri, resident reported. Farmers worry that floodwaters may not recede until mid-summer, causing them to lose an entire growing season. Even more is at stake. The flooding will leave a layer of silt on the farmland that could take as much as a generation to clear, causing significant injury to the quality of the farmland for many years, said Attorney General Koster. A group of 25 southeast Missouri farmers filed a lawsuit against the federal government on Tuesday over its decision to open up the levee. The farmers claim that the government violated their rights by taking their land without adequate compensation. The lawsuit seeks class-action status.